We have it. 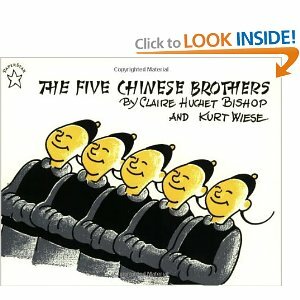 We thought a nice Chinese story would be great for Baby G. Wrong. The first brother “gets into trouble” when he kills a small boy because he was showing off his gift! The town/government meets and decides his punishment is death (I know kind of gruesome for a kids book, but that is not the real issue). He has one night to go home and say bye to his father. The next day they will chop off his head. Rather than accept the judgment of his peers. His family decides they do not like the decision of the people and thus proceed to send the 2nd identical brother whose head cannot be severed. The story continues like this with each brother until they all live happily ever after because they fooled the townsfolk. And the moral of the story is: You did something wrong. You know you did it. You don’t like your punishment, so you simply keep cheating the system until they get tired of you!